Clutter has a way of creeping into our lives so slowly, we hardly notice it at first. A little pile of mail on your desk, some kids school papers on your kitchen counter, a few toys left in the livingroom…. 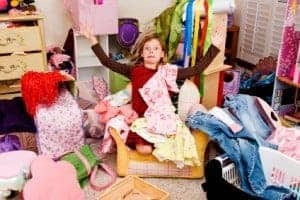 The problem with a tiny bit of clutter creep is that it quickly multiplies, and before you know it, your home looks like you should be on Hoarders! Stop the creep today! Each week, set your timer on your oven for 30 minutes and banish the piles of clutter! If you’ve let it go awhile you may need to start in just one small area each day. Remember the important rule though, don’t just move it somewhere else, put it AWAY in it’s home. It doesn’t have a home? Maybe the garbage bag should be it’s new home! Ok, Ok, you want to keep your junk. You need to MAKE a new home for it then and always put it back there when you are done. 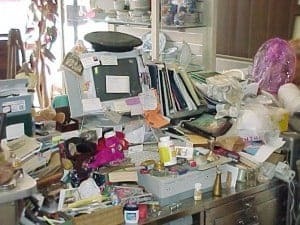 Yesterday I noticed some clutter creeping on my desk…I set my timer for 30 minutes and tackled my desk and all the other piles throughout my home. Don’t feel like cleaning? Alright dude, but just be warned, 30 minutes today saves for 3 hours tomorrow… If we keep putting it off, the clutter will become out of control, and then your only solution is a match. You may think that I’m being “mean”, but the truth is, teaching your children to respect their home, their belongings and their parents is not “mean” at all. What is “mean” is letting your children grow up thinking stepping on their toys, rummaging through piles of clean and dirty clothes on the floor and constantly losing their belongings is normal. That is mean. Making them pick up their crap is good for them, and your home will thank you! Hiring help is less then you may think… and the show alone is worth it!